We also thank you for your positive comments on the cleanliness, the quietude of your room and our hospitality. It is important to us that the hotel is spotless and our staff is dedicated to this effort. We are pleased that you enjoyed our breakfast buffet and all the selections we offer. We know how important that first meal of the day is and we do our best to offer you many choices. It is crucial that our staff is friendly and helpful to our guests as it makes all the difference in being able to have a memorable experience with us. Your room was well equipped and we are happy that you were comfortable in it and that the air conditioning was quiet and served your needs well. We thank you again for your comments and we hope that you will choose our hotel the next time you visit Rome. Il prezzo trovato è inferiore del 25% rispetto alla tariffa media di questo hotel che è pari a USD 153 a notte. Il prezzo trovato è inferiore del 27% rispetto alla tariffa media di questo hotel che è pari a USD 335 a notte. Thank you for taking the time to write a review on our Hotel Adriano and for giving us such a high rating. We are very appreciative. We are always pleased to accommodate guests who have to stay with us for business reasons. We appreciate that you liked your room and that it was very comfortable. That is what we hope for in all the reviews our guests write. Our location is central to everything. All of the government and professional buildings as well as our fine shops, restaurants, cafes, pizzerias, gelaterias and musems. And if you are touring, we are a 5-10 minute walk to the Pantheon, Piazza Navona, Spanish Steps and Trevi Fountain and a 15-20 minute walk to the Vatican and Colosseum. As you mentioned, the train station and airport are also easily accessible which contributes to our location being good. Thank you so much for stating that our staff is very courteous. This is another aspect of service that must be held in high regard. Our staff must be accessible to the needs of our guests and they must do so in a helpful and courteous manner. So we are pleased to read that your needs were met. We thank you again and we look forward to serving you in the near future. 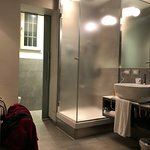 Organizzo le mie trasferte Romane solo se trovo posto in questo Hotel. Hanno una bellissima sala ieri la prima colazione...e tanto altro. Non vi dico nulla, cosi andrete a soggiornarvi...merita. Consiglio sulle camere: Quelle con la terrazzaval 4 piano...vista sui tetti di Roma. We are so grateful that you stumbled across our hotel 15years ago! It makes us very proud to know that unless you find a room in our hotel you will not plan your trip to Rome, that's real commitment and we are so impressed. Thank you for complimenting our beautiful breakfast room, it is lovely and we hope it adds to our guests' experience when they dine in it for our extensive breakfast buffet. We love the fact that you are keeping the rest of your comments a mystery so that our readers will come to discover for themselves why you constantly return to us and give us such a high rating. Thank you so very much and we look forward to serving you again the next time you are in Rome. We thank you for taking the time to write a review on our Hotel Adriano. stones throw away from the hotel. Thank you for positively commenting on our décor and stating that our staff is very professional. It is important that the total environment of the hotel is pleasing to the eye and that it is spotless. What also makes for a memorable stay is the behavior of our staff. They are here to serve your every need and to do so in a friendly and helpful manner. We also thank you for complimenting us on our buffet breakfast. We receive many guests from all over the world and we try to have something for everyone. We serve scrambled eggs and bacon, hard boiled eggs, platters of ham and cheese, croissants and a variety of breads, cereals,yogurts, fresh fruit and fruit juices, home baked cakes,biscuits,muffins, tea, coffee,espresso and cappuccino. In addition, we can accommodate vegans and celiacs as long as you inform us at the time of booking. We encourage all our readers to view our official website in order to view photos, dimensions, price and amenities of our rooms. This will assist you in having a better idea of what you are selecting and what to expect. We are more than happy to provide you with a different room as long as we are not fully booked. We thank you again for your comments and hope that in the future you will consider staying with us again. Mi trovo spesso a Roma per lavoro e l'Adriano è ormai meta fissa. Personale qualificato, cortese e pronto a risolvere ogni problema. Grande cura dei particolari e della pulizia delle camere. Ottima anche la colazione. La posizione strategica consente a chi viaggia per lavoro di avere tutte le comodità del centro senza L'eccessiva ressa di turisti. Veramente una sicurezza a Roma. We are proud to be able to also accommodate our guests who are here on business and we appreciate that you continue to choose us as you hotel when you need to be in Rome. We thank you for your compliments that our staff is qualified, courteous and able and ready to solve any problem you may have. That is quite an accomplishment. Our housekeeping staff is very attentive and they do make it their goal to have the entire hotel be spotless and the feedback we receive on that issue is evident in the reviews we receive. In addition, our breakfast buffet is also a crowd pleaser. We know how important that meal is and we know that most of our guests will be out and about all day. We want them to have a balanced and nutritious breakfast that will keep them energized during their touring. As a result, we serve scrambled eggs and bacon, hard boiled eggs, a platter of ham and cheese, croissants and a variety of breads, fresh fruit and fruit juices, cereals and yogurt, home baked cakes, biscuits, muffins, teas, coffee, espresso and cappuccino. In addition, we can accommodate vegans and celiacs as long as we are informed at the time of booking. Our location is excellent, we are right in the center close to all the finest restaurants, cafes, pizzerias, and gelaterias, yet away from the hustle and bustle of the crowded tourist area. Also, we are a 5 to 10 minute walk to the Pantheon, Piazza Navona, Spanish Steps and Trevi Fountain and a 15-20 minute walk to the Colosseum and the Vatican. We hope you will continue to choose our Hotel Adriano each time you need to be in Rome. We look forward to your return. We are very pleased that you enjoyed your stay with us. As you noted, we are centrally located. In walking distance to all the famous sites as well as the main shopping centerof Rome. We are very lucky to have a parking garage located right next door to us who offer our guests a discounted rate since there are hardly any parking facilities in the center. We were happy to also accommodate your pet with advance notice. We know that in certain circumstances one must be accompanied by their pet. We thank you so much for saying that our breakfast buffet was unique and we accept your congratulations! We try very hard to offer a wide variety of items to meet the needs of our international clientele. We serve scrambled eggs and bacon,hard boiled eggs, ham and cheese platter, croissants and a variety of other breads,yogurt, cereals, fresh fruit and fruit juices, homebaked cakes, biscuits, muffins, coffee, tea, espresso and cappuccino. We can also accommodate vegans and offer gluten free items if you inform our staff at the time of booking. We are glad that you will be returning to us in the future, so we will look forward to your return.